How Does The 3-Parent Baby Technique Work? 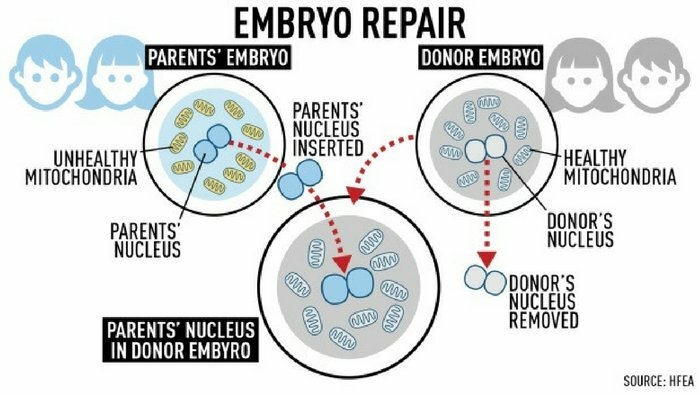 To prevent children from inheriting mitochondrial defects from their mothers, scientists remove the nucleus DNA from the egg of a prospective mother and insert it into a donor egg from which the donor DNA has been removed. This can occur before or after fertilization. The resulting embryo contains nucleus DNA from its parents, but mitochondrial DNA from a donor. The DNA from the donor amounts to less than 1 percent of the resulting embryo’s genes. Fertility clinics which have been approved to use the techniques will perform them on a case-by-case basis. In September, a doctor from a Manhattan fertility clinic announced that the world’s first 3-parent baby had been born to Jordanian parents in Mexico 5 months prior. The doctor who performed the mitochondrial-replacement technique, called spindle nuclear transfer, had to do so in Mexico because the technique is not approved in the U.S.
“What happens when you pass down changes to human DNA from generation to generation?” That’s the question critics of the techniques are asking, and the answer is: “Nobody knows.” Nobody has ever done this before. It’s more than a bit terrifying to think that we won’t know the ramifications until a person born using these techniques has spent a lifetime on this planet. Considering how much heartache and distress GMO seeds have caused, something would have to be wrong with scientists who don’t have concerns about genetically engineering human embryos.